Leaving Mom And Dad Behind In China For School In The U.S.
Interactive: Who’s Coming To Texas? Growing up in a traditional immigrant family can be rewarding and challenging for kids born in the United States. 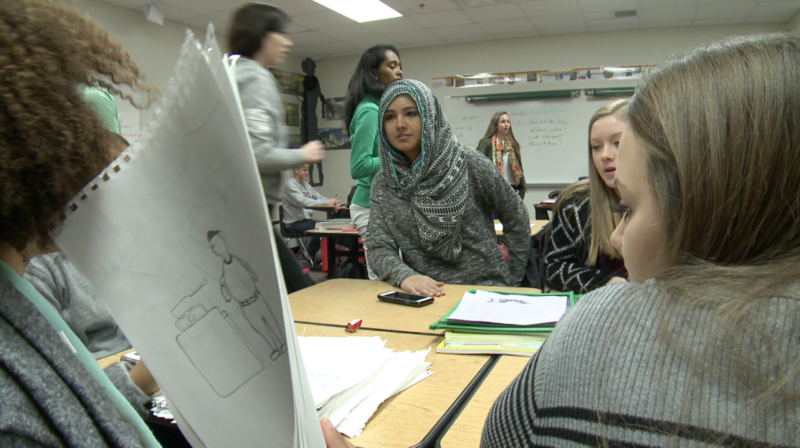 Meet a Frisco high school student who’s managing to practice her religious faith and be a regular American teenager. More Muslims live in Texas than any other state, according to the 2010 U.S. Religion Census. You see that in school hallways across North Texas. 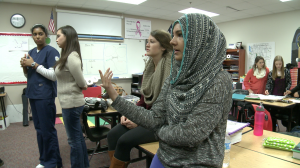 At Liberty High School in suburban Frisco, an American-born teenager has decided to wear a hijab. Irum Ali wrestled with the decision for months. Irum was at her mosque one night a little more than a year ago when the idea to wear the traditional head scarf crystalized. It was Eid al-Fitr, the Muslim holiday marking the end of Ramadan. 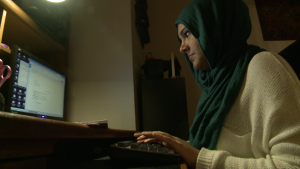 Irum’s mom, Farida Ali, says she was caught off guard because no one else in the immediate family wears a hijab. Ali and her husband, Mir Hammad Ali, were born in Karachi, Pakistan. Mom covers her hair when she visits the Frisco mosque and prays five times a day. Wearing the hijab, she says, is a personal decision. For Irum, who’s a 17-year-old senior at Liberty, it’s a symbol of modesty. Something she says is undervalued in today’s culture. Still, it can be hard to make a first impression. So she’s found ways to combat that. She’s just another student at Liberty, says Jay Sommers, her teacher. Irum has a sense of humor, too. Not to mention school spirit. Last spring, she showed up at a baseball game as Rocky the Red Hawk, the school’s mascot. Sommers asked Irum if being a mascot interfered with her religion. She told him it didn’t. Irum is used to role playing. 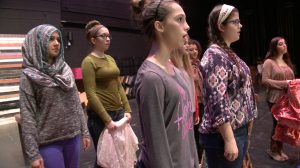 Irum’s been in theater since sixth grade. She prefers being behind backstage, working on lighting and props. On this day, she stands in as a factory worker. About 200,000 Muslims live in North Texas. And the change is easy to see in Frisco. Twenty years ago, not even 1 percent of students were Asian; today, it’s 14 percent. Sommers, Irum’s teacher, says that ethnic mix of students is an advantage in the classroom. James Caldwell, the student assistance coordinator at Liberty, says today’s kids seem more open-minded about other cultures. Still, there are challenges. “We know that some of our kids who are Muslim are bullied for wearing clothes that are not typical of a lot of the kids at their school,” Caldwell says. Frisco high schools tackle bullying by setting aside half an hour a month for teachers and students to talk about the climate there. Outside school, Irum says, she’s felt the sting of racism. At Liberty, though, she hasn’t been bullied. At first, some kids didn’t recognize her in a hijab – they were used to seeing her big, curly hair. Now, it’s no big deal. In the meantime, she’s focused on just being a senior. And five months from now, she’ll be walking across the stage — wearing a hijab and carrying a diploma. In Texas, one in three children has a parent who’s an immigrant -- or they're immigrants themselves. They have to learn a new language, adapt to a different culture and try to fit into a community that may not embrace newcomers. Follow these first-generation Texans and the educators weaving them into the American tapestry. This project was reported with assistance from an Institute for Justice & Journalism fellowship. © North Texas Public Broadcasting, Inc.